Study finds that death metal makes people feel "joy and peace"
There have been many investigations in recent years that have looked at heavy music and its status in the world. Studies have suggested aggressive lyrics are good for the soul, that metal fans are loyal, that they're more concerned with how things work than how people feel, that they grow up to be better adjusted adults, that heavy music helps fans deal with their fear of death, and even that metal vocalists share vocal techniques with babies. 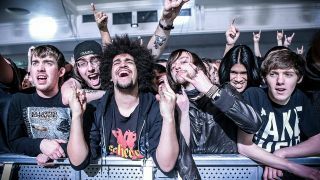 Now, a study by Australian university MacQuarie has officially determined that death metal fans are more likely to experience feelings of inner joy, noting in a recently-released report that: "Fans of violent death metal music experience power, joy and peace while listening to this music". The university's music lab used Bloodbath track Eaten in psychological testing on 80 participants – 32 of which were self-professed death metal fans – which aimed to find out whether or not "long-term exposure to violent media may decrease sensitivity to depictions of violence". The study found that while those participants who were unfamiliar with the genre found listening to the music uncomfortable and were like to experience "tension, anger and fear", death metal fans experiences brought "peace, joy, power and wonder". It also determined that fans of extreme music are not desensitised to brutal or violent imagery. The study forms part of a long-term investigation by Australian professor Bill Thompson on the emotional effects of music. "Death metal fans are nice people," Thompson told The BBC. "They're not going to go out and hurt someone." He continues: "Many people enjoy sad music, and that's a bit of a paradox – why would we want to make ourselves sad? The same can be said of music with aggressive or violent themes. For us, it's a psychological paradox. As scientists, we're curious, and at the same time we recognise that violence in the media is a socially significant issue." Thompson writes in The Conversation: "Instead of leaving fans feeling hostile, the music helps them to discharge or distract from their own negative feelings, increase energy levels, and generate powerful, visceral emotional states. "Non-fans were understandably troubled by the violent, often misogynist lyrics, which typically lack the narrative context and moral point that justify representations of violence in theatre or film. "However, fans typically expressed no such concerns about the lyrics. When describing their motivations for listening to the music, one fan speculated that 'It has something to do with the primal scream in us: it’s a release – accepting and empowering'".